WHAT IS BUILDING A CUSTOM HOME ON YOUR LAND? Building a custom home on your land is a very different process than either buying an existing house or having a new house built in a neighborhood. First, if you’re having a home built on land that you own, then you own the project from the very beginning. And you only get one shot at it. Second, since you own the land, you—not the builder—provide the financing. Those two differences mean that building on your land is a much more emotional process than simply buying a home or having a new house built in a neighborhood. Whether it’s a good or bad emotional process depends on how accurate your expectations are and how those expectations are met. Where do I start when building a custom home on my land? How do I find a builder I can trust? How do I know how much I can afford? How do I get the money? How do I find land, figure out if it’s good to build on, and buy it with confidence? How do I get the best house plan for my needs? How do I avoid the horror stories of building a custom home? 1 Introduction: Everything you wanted to know (and everything you need to know) about building a custom home on your land. 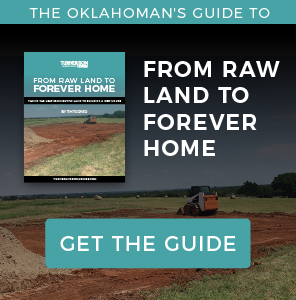 The purpose of this guide is to give you the knowledge you need to achieve your dream of having a one-of-a-kind custom home on your own land. We want to empower you to confidently go out and get all the necessary pieces together to make this dream come to life. A word of caution: It’s tempting to think you can navigate the home-building process on your own. Yes, it is entirely possible to get a house plan, hire each subcontractor yourself, make a few phone calls, schedule the work, and avoid paying a professional to build the house for you. We all live, or have lived, in a house and land is land, so it all seems familiar, right? I’ve built hundreds of homes myself, not to mention how many my father has built since 1964. Believe me when I tell you we learn new lessons every week. The cost of those lessons can be in the hundreds of thousands of dollars. You can’t afford to make those mistakes on your own house. You risk going so far over budget you’ll either go broke or you’ll have to sell the brand new home you’ve built because you can’t afford it. At the very least, you’ll have invested much more than if you had hired a competent builder, plus you’ll have a lot of frustration and regret as well. A house plan that fits your needs, wants, and budget. We will cover each item in detail in the paragraphs below. There’s a lot to this, but don’t get discouraged. We’ll walk you through each step, introduce you to some unfamiliar concepts, and make sure you know enough to make your dream happen much sooner than you think without risking your financial future. This guide follows the most common path that most people who are building a custom home take as they navigate the process. But, of course, everyone’s path is a little different. Click on the step you want to explore first, then come back and click on the next one that makes sense to you. 2: Where do I start when building a custom home? For some things in life, especially complicated projects, getting started is the hardest part. That’s definitely true for building a home on your land. There are lots of variables, moving parts, and people that need to be involved. And there’s no real structure in place to help you get it done. What do I mean by “no structure”? Think about the other big purchases or big decisions you make in life and how there’s usually a well-defined process in place. When you buy a new car, for example, you can compare different makes and models and test drive each car to figure out whether or not you like it. Once you pick a car, you can get the financing done right there at the dealership. A car dealer can walk you through the whole process if you want to go that route. It’s not always a pleasant process, but it’s a pretty clear process to follow at least. The process for buying an existing house can be similar. There’s an entire industry built around making loans for people to buy houses, and there’s even a government program that backs it up (Freddie and Fannie). There’s a state-licensed industry of real estate agents ready to help you find the house you want with an entire set of documents (contracts, inspection forms, disclosures, etc.) that walk you through the real estate transaction. The existing process helps you navigate the legalese and avoid the biggest pitfalls. It might not be a perfect process, but it’s surely better than if you had to figure it all out on your own for the first time. But somehow, building a house on your land can be a much more daunting process. It can seem like there are no rules, nobody is in charge, and there’s no written guide to walk you through all the steps. To make matters worse, there are huge financial risks involved. You could buy the wrong piece of land and find out it’s not suitable for building, hire the wrong builder and get a poorly built house, or go way over budget because of unforeseen costs. Seems kind of discouraging, but don’t lose hope. After building hundreds of homes for different families and individuals, we’ve seen which overall methods work best for people and which don’t. The big lesson is this: You need someone to act as your guide, just like an expert mountain climber will hire a local guide to help find the best route up an uncharted peak. That guide is someone who has done this before—someone who has made the journey and has helped many others make it. He or she knows all the pitfalls and dead ends and can help you navigate through them successfully. That person is a home builder. That’s the first official step you’ll need to take in this journey—find your builder. Your home builder becomes your guide and your concierge along the way to help you navigate the process. But it’s not just a matter of finding any home builder—you need to find the right one. And that in itself is a process. Before we talk about finding the right home builder, we’re going to talk about figuring out exactly which journey you’ll be taking. You don’t want to hire an Alaskan fishing guide if you’re going to be rafting the Colorado River, and you don’t want to hire a mountaineering guide for your ascent of Everest if that guide has never been outside the state of Utah. Figure out where you’re going first, then hire the right guide to get you there. You’ve probably felt a need, a burning desire, or just an itch for something different. And you’ve at least thought that building a house on your land is one possible solution. Or, maybe you’re all in and you’re going to build that custom home come hell or high water. Either way, now that you’ve identified the need, it’s time to paint the picture of what the ideal solution looks like. Let’s start there. While dreaming about that new house, think about the activity going on in and around it. What does life look like? What do you and your family do there? Do you have lots of guests over? Do you enjoy quiet evenings on the porch? These visions of life in the home are what’s going to drive the design, features, and location. What are the must-haves in your custom home? In the above exercise, you probably envisioned the lifestyle things that are most important to you. Which of those things, if dropped from your custom home plan, would make it no longer worth the effort to build a custom home? Those are your non-negotiables. In other words, if you can’t get those things, you’ll just stay where you are. Thinking further, what are the absolute most important things you want? The things that you would sacrifice any other part of the dream to make come true? Maybe it’s getting the kids into a particular school or being able to live in a place that is a positive influence on them. Whatever these things are, that’s your bottom line, the heart of the matter. These are the things you’ll find a way to make happen, even if it means buying a fixer-upper and putting in lots of sweat equity rather than building a custom home. Defining your must-have features and your bottom line up front is tremendously helpful. Talk about it as a family and write it down. All of it. Later in the process when the emotions kick in and you have to make tough decisions about what to leave in or take out based on your budget, you can go back and refer to the written list. Want additional resources on defining your priorities when deciding on the perfect house plan? Download our 3 Steps to the Perfect Floor Plan ebook. There, I said it. Budget. Everyone has a budget. Even the wealthiest people in the world have to eventually make decisions about budget and priorities. At this point, you may or may not know what you qualify for in terms of a loan to build the house, but you probably have a comfort zone of what you want to spend, either in monthly payment terms or in overall purchase price. Some people base it on a detailed monthly budget, some people on a gut feel of an overall number they’re comfortable with, and some people start by figuring out when they want to be debt free and backing into an amount that way. You’ve defined your budget comfort zone… now what? Now you know your boundaries, which means you have a mental picture of what you’re looking for and will know it when you see it. Defining your terms is half the battle. Before, you were like a mountain climber looking out at a vast landscape of peaks unsure of which to climb. Now, you’ve put a red circle around the peak you intend to conquer. You have the peak in mind, but you’re still in foreign territory. You need a professional guide to show you the approach and ascent route and to help you negotiate your way around the hidden cracks in the ice that an untrained eye will miss. Those cracks are things like zoning, permit requirements, flood zones, bad soil conditions, hidden drainage problems, deep water tables, hidden “gotchas” in house plans, building quality issues that won’t surface for months or years, unethical or poor quality contractors, and much more. It might seem counterintuitive to hire the builder first. After all, you don’t have a house plan, you don’t know exactly what the house will look like or cost, and you don’t really even know whether what you have in mind is feasible given your budget comfort zone. You also don’t know whether your budget comfort zone aligns with the construction and permanent loans you can qualify for. How will you hire a builder at this point? It’s a little bit of a chicken-and-egg dilemma. You can’t agree with a builder on a price for a particular house because you haven’t defined the house yet. You can’t define the house without a house plan, and if you design or choose a plan, you have no way of knowing whether the plan will fit your budget. Without talking to a lender, you don’t know how much you are qualified to borrow, and you might be worried that someone could take advantage of your lack of experience building a custom home. The thing is, the builder is the one person who deals with all of these things on a regular basis. He knows the cost to build, and he can guide you through the processing of selecting and customizing a house plan to make sure you’re getting the right plan. He can also help you avoid the hidden design elements that add cost without adding value. The builder deals with construction loans, land titles, land preparation issues, contractor problems, and everything else that goes along, even peripherally, with building a custom house on your land. The builder is the center of the hub. The builder is also the one make-or-break element in the whole process. A bad relationship with a builder risks your whole dream. A good relationship will make the dream become a reality. So, how do you find the builder that’s going to be the right builder for your dream? And once you find him or her, how do you hire that builder before you’ve even defined the house plan or the budget? 3:How do I find a builder I can trust? The first thing to do when looking for a builder is similar to the process outlined in the previous section. Do a little self-reflection and decide what you’re looking for first, in concrete terms, before setting out on the journey. Why? If you don’t determine your own standards for what you’re looking for, you’ll fall into the trap of letting the builders you talk to define terms for you. Here’s an example: Every builder has what he or she thinks is his or her competitive advantage. That’s what each one will emphasize as the most important thing to evaluate. Let’s say the first builder you talk to advertises a low price per square foot, which seems very attractive because that’s a simple way to compare houses. (Keep in mind that these houses aren’t even defined yet, much less built.) If you talk to that builder first, you’ll come away with a new comparison tool, and that tool might be the one you use to compare builders. So what just happened? You allowed the company you’re trying to evaluate to create your buying criteria for you. You probably don’t need a reminder that this is an important, and risky, process. Your dreams are at stake, and this project can have a huge impact on your family’s financial safety. You need to find a guide (builder) you can work with. You’re buying your dream, and that happens to include buying a building process, a warranty process, the work of many subcontractors, a builder’s reputation, and finally, a custom home finished the way you and your family want it finished. The builder you choose needs to be someone you want as a partner in the entire process, not just someone who completes a transaction. Chuck in the truck with the taillight guarantee. That’s the mom-and-pop builder who builds five or ten homes a year, works out of his pickup, and looks like a subcontractor. He was probably a really good trim carpenter or other tradesman who built a house on the side and sold it, and now the bank gives him a credit line to build a few houses at a time. The problem is, he has neither the financial capacity nor the time in his day to come back and fix any warranty issues. Once he’s done and you’ve paid him, you’ll see his taillights as he’s off to the next job and probably won’t ever return another phone call. The enticing low price per square foot. Ask yourself this question: How can a builder tell you what the price per square foot will be of a house that isn’t even designed yet? A custom home that is created specifically for you, by definition, has never been built. How could anyone possibly tell you how many dollars per square foot an imaginary house will cost? They can’t, unless they’re trying to rope you into a commitment so they can change the price later. The “standard” list of specifications. There’s nothing “standard” about a custom home. The two words mean opposite things. If a builder hands you a list of “standard features,” he’s telling you this is how he wants to build the house. Shouldn’t you be the one telling him? Also watch out for items like “3500 psi concrete” or “anchor bolts.” These items are on the list to make you think they’re special. They aren’t… they’re required. Unfortunately, there’s a very low barrier to entry into the homebuilding profession. That’s why most of the stories you hear from people about having a new home built are horror stories. Here’s how the typical custom homebuilder’s process works. Get a customer, usually someone who has seen a home he’s built and liked that floor plan. Get a commitment from the customer in the form of a cost-plus building contract using a cost estimate that is wildly optimistic. Get a house plan the customer likes and start building ASAP. Have the subcontractors estimate material quantities and types and buy whatever they tell him. Send invoices to the customer to pay weekly. The invoices will look like Greek to the customer, who has never built a house, so the customer will probably just pay them. When the house starts going over budget and it becomes evident the estimate was wildly optimistic, the builder will explain it by saying the cost of materials has gone up (inflation, right? ), or that the customer made some changes, or some other excuse. When the customer makes selections or changes, the builder never writes anything down. If he does, it’s on a legal pad that has about a thousand pages flipped over on it with notes from eons ago. When he gets in his truck, he throws that legal pad up on the dash along with about 20 rolled up house plans that have been there since 1997. At closing, the builder does a cursory walk-through with the customer and fixes about 20% of what’s on the list and promises to do the other 80% after the customer moves in. At closing, the builder asks for payment for about $30,000 worth of undocumented change orders. The banker frowns and grudgingly increases the amount of the construction loan because he doesn’t really need or want a house in his inventory. The customer grudgingly pays the builder because what else are they going to do? That all sounds very jaded, I know. The good news is that’s not how every builder works. I know of a select few in Oklahoma City who I would hire in a minute to build a home for my family. Here’s how to identify the world-class custom home builder. There’s a clearly defined process for everything up front—from designing your custom house plan to selecting every feature from door knobs to carpet. Everything, and I mean everything, gets written down. When you make a change during construction, the builder writes a change order and gets the customer to sign it and pay for it at that time. There will be absolutely no surprises at closing. The building contract has a detailed list of every material that’s proposed for the customer’s home all the way down to the color of the door hinges. The builder has a written warranty document that lists everything that’s covered, along with standards of acceptable and unacceptable work. The owner of the building company doesn’t have to babysit the jobs under construction because he employs a team of experts to handle those details better than he can. In other words, he has attracted talented and skilled individuals who specialize in their particular areas rather than him trying to be a Jack of all trades and a master of none. Now that you know a little bit about the inner workings of the homebuilding industry, let’s talk about how to find that builder who is the combination of a capable professional and a good fit for your needs. There are a couple of ways to evaluate quality, both of which are based on history. You could become an expert on residential construction methods and building codes then go out and inspect a builder’s homes under construction to assess their standards. Chances are, however, that you have an occupation of your own and don’t really have the excess bandwidth to go out and learn a new profession. The second option is to determine the builder’s quality of construction through reputation, which won’t require you to become an expert on residential construction. Before we talk about how to effectively and reliably research a builder’s reputation, I want to make a key point about quality as it pertains to building a new home and the way the industry works. There are more builders than there are subcontractors, like trim carpenters, painters, framers, plumbers, etc. That means builders share these subcontractors, and many of the builders you will be comparing for quality will be using the same subcontractors. If many builders use the same contractors, is the quality level among those builders the same? The answer is no. Why? Because different builders have different internal processes and tolerate different levels of workmanship. As human beings, most contractors will take the path of least resistance. If they make a minor mistake, they’ll ask themselves whether it really matters. If the answer is “no,” they’ll leave it and move on. If the answer is, “The builder isn’t going to pay me if I leave it like this,” they’ll fix the mistake. Some builders have processes that ensure they catch all the little stuff and some don’t. The contractors know which builders are which. Back to determining the builder’s quality through reputation. What you really want to know is whether the house you’re having built will serve your needs over time without lots of expensive repairs or hassle. How will you know? Here are a few methods. Check the builder’s online reputation. This isn’t about glancing at the number of stars on a Google review. Read the comments people have left, both the legitimate complaints and legitimate praises. Look for yourself in the comments, which means note the positive or negative reviews that touch on your personal hot buttons. Ask some of their previous customers. Request a list of past customers from the builder. If they’re smart, they’ll only give you a list of happy customers, so keep that in mind. Ask those customers about the details of the builder’s process, how well they communicated during the process, how responsive they were to concerns or mistakes, and how they responded to repair requests after closing. Ask local bankers that provide construction loans. This might require a little extra research to identify the banks, but when you do, ask them which builders have the best reputation for staying on budget. Bankers who do lots of construction loans will know. A word of caution: Don’t be tempted to skip all of this research because you know a guy from church who builds houses. See the above “Chuck in the truck…” example. You and your family deserve better. To recap, when you’re checking reputation, remember there are two major aspects of building that you’re evaluating: the process and the quality of the final product. An awesome final product doesn’t matter if the building process makes you crazy. 4:How do I know how much I can afford? How do I get the money? If you have the cash to pay for your new home without borrowing from the bank, then you don’t need the bank. We’ll talk more about paying with cash later, but most people building a custom home will go through the construction loan process. You might be thinking, shouldn’t I figure out my budget and the house I’m going to build before I apply for a construction loan? That makes sense on the surface, but I’ve witnessed firsthand the utter emotional devastation of families who have fallen in love with the perfect house plan only to discover during the loan process that the house is way beyond their financial reach. They can’t get the money to build the house they fell in love with, and they walk away from the whole dream instead of scaling it back to make it happen. Before you make the emotional commitment to a house you can’t afford, figure out what you can afford. Then you can decide whether to make your dream happen now at the scale you can afford or wait until your income can support the bigger dream sometime in the future. Borrowing to build a house is different than getting the permanent loan that most are familiar with. Let’s start with a couple of definitions. Permanent loan. Typically called a mortgage, this is the kind of loan you get when you buy a house (either new or used) and make payments for 15, 20, or 30 years. You can’t use this kind of loan to build a house, but you will use this loan once your house is finished. You get a permanent loan from a mortgage company, not a bank. Yes, some banks have mortgage companies, but they’re different entities. Permanent loans include principal and interest payments, and the loan payment may also include home insurance and real estate taxes. Construction loan. This kind of loan is a temporary, sometimes called interim, loan that comes from a bank. It has a very short term, usually nine to twelve months, at which time it must be repaid in full. When your new house is finished, you close on a permanent loan that pays off the construction loan. Once that’s done, you start making monthly payments just like if you had bought the house and lot together from a builder. Before the lender agrees to lend you money for anything, he or she needs to make sure you can repay the loan and can do so without depriving yourself of food and clothing. This is the part where you gather all those documents that describe your financial situation in great detail: W-2s, tax returns, bank statements, etc. Most of us find this process a little unnerving, kind of like sitting on the doctor’s exam table with nothing on but a hospital gown. Just know that it’s a necessary part of the process and nobody is judging you, even though it certainly feels that way. Once you’ve provided all your info to the loan officer (the bank term for “salesperson”), the loan officer will turn it all over to an underwriter. No matter what the loan officer has told you, whatever bright promises he or she has made, the underwriter is the one who will put all your financial documents under scrutiny to determine whether or not you are qualified to borrow the money. Your income. If you’re applying as a married couple or applying with someone else jointly, it will be your combined incomes. Your debt-to-income ratio, which is simply your monthly debt payments divided by your monthly gross income. In general, your debt-to-income ratio must be 43% or less. Your credit report. Note that we didn’t write credit score, but credit report. Your report affects your score, but the lender wants to see the information that underlies your score. As part of the approval process, the banker will tell you how much money they’ll lend you, which is subject to the appraised value of the house you’re going to build. Your permanent loan also factors into the construction loan approval, as the bank wants to make sure they will get paid back when you get your permanent loan. To do that, they’ll likely make sure you qualify for the construction loan now and check that you’ll be able to qualify six to nine months from now for a permanent loan. The land you’ll be building on. At this point, you probably don’t know exactly what house you’ll be building, which is good, because you just found out from the bank the maximum amount of money you can borrow, which might end up being different than the actual amount you borrow. Once you’ve defined the house plan that fulfills your dream and fits your budget, you’ll submit the plans, specifications, and building contract to your banker. The banker will hire an appraiser who will complete an appraisal report, which is basically an expert opinion of the market value of your to-be-completed house. The maximum amount you’re qualified to borrow. Let’s say the bank approves you for a $250,000 loan. The house with land appraises for $325,000, and 80% of that is $260,000. The bank will lend you $250,000 since that’s the maximum amount you’re qualified for. But if your house with land appraises for $300,000, and 80% of that is $240,000, the bank will lend you that amount for your construction loan. Here’s where the LTV can work to your advantage. Let’s say the first example above is true, and you get a $325,000 appraisal. Let’s also say that the combination of house plus land will actually cost $300,000. That means you’ll only have to come up with the difference of $50,000 rather than the $60,000 you would have to come up with in the second example. Armed with this knowledge, make sure to ask the banker if the loan amount is actually based on appraised value and not cost. Some banks will use the term “Loan to Value” when they really mean “Loan to Cost.” That means if the appraisal comes in higher than your cost to build, you won’t get the advantage of the higher appraisal. Three things need to come together so you can close on your construction loan, which means you sign papers and start getting money to build. A quick word about land title: Ever since land existed as something people could legally own, someone has owned the land you’re about to build on. There’s an accepted and legally recognized way to transfer ownership from one person to the next. Every document recording such a transfer, as well as mortgages and other things affecting the land, is stored in chronological order in the bowels of a facility run by whatever county your land is located in. Because the bank wants to make sure it’s making a loan on land you actually own (or will own) without some other party having a legal claim to it, the bank hires a title company to analyze all those records to make sure the title is clean. A clean title means there’s no question of who owns the land. You can read more about land title in this article. At closing, you will sign a mind-numbing stack of documents for the bank and a few for the title company. Essentially it all boils down to the simple acknowledgement that you’re going to borrow a certain amount of money from the bank, they’re going to charge you interest, and you’re going to pay it all back on a certain schedule. Now that you’ve closed on the construction loan, you’ll probably make a deposit to the builder, which serves two purposes. It demonstrates good faith, which means you’re serious and will pay the builder as promised. It gives the builder a little money to start committing subcontractors to begin work. And so forth until all payments are made. Basically, at predefined phases of construction, you’ll pay the builder predefined amounts of money until 100% of the work is complete and 100% of the contract amount is paid to the builder. Once that’s done, you’ll set up a closing for your permanent loan, more commonly known as a mortgage. The permanent loan pays off the construction loan, and then you start making your monthly payments. If you are paying to build your custom home with cash, you’ll need to take some precautions. Be sure to protect your budget and time the outflows of cash properly. You’ll also need a safe method to prove to your builder that you have the cash available, and you’ll want to keep your cash in a place that’s comfortable for both you and the builder so that you’re both confident it will be there when it’s time to pay the construction bills. The house and all the things that affect how much it will cost, such as the size, efficiency of the layout, features, amenities, and finishes. Both the above items are covered in detail in the next sections. The main thing to remember is to take everything into account and recognize how all the variables work together. Choosing land that has extensive site prep might eat into your house budget, and choosing a house plan that’s bigger than you had initially planned might eat into your land budget. There’s also one additional critical factor to consider: the commitment of time and energy, which you need to budget (or plan) for as well. Building a custom home, even with the most efficient process through a qualified builder, still takes a lot of time and energy. Make sure you’re ready for it. 5:How do I find land, figure out if it’s good to build on, and buy it with confidence? If you already own the land you’re planning to build on, skip ahead to the next section. But if you’re starting at the very beginning of a dream and have not yet purchased land, keep reading. Finding and buying land can seem like a stressful and painful process. There’s no instruction manual on how to do it or even a clear place to start. We’ve helped many families work through the struggle of finding, evaluating, negotiating, and closing on their dream piece of land. In the years of doing this, we’ve seen patterns emerge and have helped many different people solve similar problems. In this section we’ll cover the basics of finding and buying your own land. 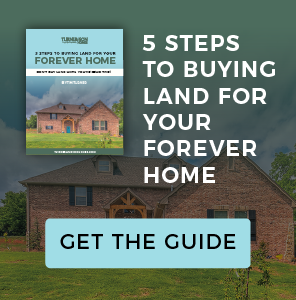 If you want a more detailed guide to work through the process, download our ebook 5 Steps to Buying Land for Your Forever Home. There are five basic steps to finding and buying a piece of land for your forever home. Financing. How you’re going to pay for your land comes first. Without a source of funds, you’re just daydreaming. Finding. This one seems simple, but finding the right piece of land can be the most difficult and frustrating step. After all, nobody is making any new real estate. Evaluating. This is the step where you have to figure out whether the land you’ve found is even suitable for building. Negotiating. Sometimes, land that’s for sale is overpriced (or perhaps underpriced). Or you may find land that isn’t on the market but could be bought for the right price. In either situation, you have to find the market value and negotiate reasonable terms with the seller. Closing. This is when the land and money change hands. It’s critical that you know the steps, how long each step will take, and whether you’re actually buying what you think you’re buying. piece of property but don’t have your financing lined up, you might lose the land to someone else because you can’t complete the sale before the contract deadline. If you get approved for financing first, you’re ready to buy. For many people, getting financing is the hardest part—not because they don’t have the resources, but because getting any type of loan from a bank is a total pain. And to be honest, most banks don’t really want to loan money for someone to buy raw land. Your timing makes a difference in the financing. Do you want to buy the land and start building immediately or buy the land now and build sometime in the undetermined future? Buying and building immediately requires a construction loan, while buying and waiting to build requires a land loan. A land loan is typically a 15- or 30-year loan like a typical mortgage, whereas a construction loan is a short-term loan with interest-only payments to finance the construction process. To obtain financing, you’ll need to supply all the usual financial documents to get approved for the loan. You’ll also need the legal description of the land, the appraisal, and a title commitment showing that the land you’re about to buy is legally owned by the person you’re buying it from. If you’re buying and holding the land, keep in mind that banks consider it riskier to lend money for raw land than they do for a house. Because of this, land loans typically require more cash for the down payment and a higher interest rate on the loan. Finding land that meets all your criteria (location, school district, size, topography, solitude, price, etc.) can be a big challenge as well. We work with people all the time who are struggling to find that right piece of land. This isn’t an exhaustive list, but these are the ways to find land that have produced the best results for our clients over time. You can use one or more of the following techniques simultaneously to conduct your search. Real estate agents. An agent who lists a lot of land or lives in the community where you’re interested in buying land can be a key resource. They likely spend time identifying people who want to sell land, so they may know about land that isn’t on the market quite yet. They may also know about land that’s not even for sale until the right buyer comes along, and maybe you’re that right buyer. Driving Around. You don’t really need me to tell you that driving around can help you find that perfect piece of land, but if I didn’t include this method, my advice would be incomplete. All kidding aside, when you’re driving the areas you’re interested in, look for more than just “for sale” signs. Also look at the general area, the condition of the roads, how easy it will be for you to drive to and from work or school, how thick the trees are, how busy the streets are, etc. Also keep your eyes open for that ideal piece of land that isn’t for sale. You can track down the owner using county records and make an inquiry. Once you find that piece of land that you’ve been dreaming of, it’s time to think about what it’s going to take to make it ready o build a home. You’re essentially getting ready to do what a land developer does for a residential subdivision, though on a much smaller scale, so there are several areas to consider. If you’re buying raw land to build a house, there may not be any utilities already on the land. Depending on location, there may not even be utilities run to neighboring pieces of land. The type of utilities needed and the distance between your land and existing utilities can greatly impact the cost of preparing your land to build. This includes electricity, water, sewer, natural gas, and things like television, cable, and phone. Ask people living nearby who their utility companies are and call them to ask some questions about the cost to get utilities to your land. Electricity. Pretty important considering it powers all other utilities like your well or septic system and heat pump. Some electric providers will run power to your home site for free, some will charge a fee if it goes over a certain distance, and some will charge you for the full installation. Sometimes they have guidelines around when in the building process they’ll run power to your site. Basically, you won’t know what’s required until you ask the electric company. Water. Also pretty important. Is city water available? If not, can you drill a well? Don’t assume you can drill a well anywhere and get good water or enough water to supply your house. Well-drilling companies in the area will know the particulars of the water table, and they can give you a good idea of whether adequate water is available and how deep they’ll have to drill to get to it. The biggest variable in the cost of a well is depth. Sewer. This utility is the least likely to be available in rural areas, only because it has to ﬂow downhill, which limits the areas that can be served by existing treatment facilities. If no city sewer is available, you’ll need to install a septic system. The type of system and the cost will largely be determined by soil type. Read more about the specifics of septic systems here. Natural gas. You don’t have to have natural gas, although it is nice to have. You can easily do without it by installing a propane tank and propane heat, hot water, stove, and ﬁreplace. Or you can go with electric heat, hot water, and appliances. Heat pumps are very efficient and effective these days. The only thing you can’t do is replace the gas loglighter or gas logs with electric. Phone, internet, and cable. Phone is available pretty much everywhere now, and cell coverage has become nearly universal. There are still some outliers though, so make sure you talk to the phone company about their coverage before you buy. As for internet, there are rural wi-ﬁ repeating stations now that you can subscribe to, and you can get satellite TV literally anywhere you can see the sky. When it comes to flood plains, it doesn’t matter what the land looks like, where the nearest creek is, or whether it’s on top of a hill. You have to determine where the land lies in relation to the FEMA-mapped ﬂood areas. You could be planning to build on a pad that’s 50 feet above and 1,000 feet away from the 100-year flood plain, but if a little remote corner of that property touches the red shaded area that indicates the flood plain, you’re going to have to jump through some hoops to build that house. Here’s what you need to do: get the property’s legal description (the written description of the property boundaries done by a surveyor) and call the engineering department of the city or county where the property is located. They can tell you whether the property is affected by flood plains or flood ways. I once built a home for a family in a rural area that was inside the city limits of Oklahoma City. About 25 feet of the property adjacent to the road was inside the flood plain. The home site was more than 300 feet away and roughly 25 feet higher than the flood plain, so we hired a land surveyor to do a topographical survey to prove to the city that the home site was safe. In other words, there are some cases where you can get past the flood plain issue, but it may take extra time and extra money. As you’re evaluating a piece of land, you definitely want to check whether or not it’s in the flood plain and then decide potential next steps. We don’t run into this very often, but zoning can be a show-stopper. As with the flood plain question, take the legal description to the city or county and make sure the zoning is compatible with building a house. It will need to be either residential or agricultural zoning. If it’s commercial, industrial, or anything else, you’ll have to apply and get approved for a variance with the planning commission, which is tough to do. The zoning was established for a reason, and asking to re-zone a particular piece of property is asking the city to rethink its plan for that area. I’ve seen it done, but not too many times. Don’t take the current owner’s word for it when he tells you the land goes over to that fence, then down the hill to the creek, then over to that cow, then past the hay bale, 50 feet west of the old well, and back to the road. Generally when you make an offer on the land, you also make a contract requirement that the seller provide a current survey. Be sure to specify a pin survey and not just a title survey. A pin survey means a surveyor comes to the property, physically measures and marks the boundaries, and provides a graphical and textual report of the property boundaries, easements, right-of-way, etc. You want to see those official stakes out there so you can see the legal boundaries. You’d be amazed at what land owners think they own but don’t. I’ve even seen cases where all the adjacent owners agree on what they think is the boundary, but when the surveyor is done, they’re all surprised. How much is it going to cost to carve out a clear, ﬂat spot with proper drainage for your house? How dense are the trees? What’s the slope? How far is it from the road? Where does all the rainwater go? Is the soil covered by three feet of organic stuff that will have to be removed? How do you even figure that out? These are all factors to consider, and while it seems daunting, it comes down to two things: how many hours on a bulldozer and how many dump trucks? If the land is fairly clear of trees already and doesn’t slope more than about ﬁve or six feet across the building pad (the ﬂat place for the house plus adjacent drainage slopes), then the dozer can prepare the site in a day or two. If you have to clear more than about 10 small trees, figure an additional day. If you have to haul dirt in or out, the price starts to escalate dramatically. Also remember to figure the cost of making (and maintaining) an access road from the main road to the house site. There will be heavy concrete and lumber delivery trucks coming in and out, and they get stuck pretty easily. The best way to estimate this cost is to find the local bulldozer guy and have him come out and give you an estimate of what it will cost. Believe it or not, a good way to find that guy is to drive around and look for an advertising sign on a utility pole located at intersections of the main roads. Or ask neighbors who they recommend. If you’ve lined up your financing, found and evaluated the land, and everything looks good so far, it’s time to negotiate the deal with the owner. I have found that the best results come from an honest, good-faith, and fair market value initial offer. You can try to lowball the owner to get a good deal, but I honestly haven’t seen that work. The owner either gets offended and breaks off the negotiation altogether, someone else comes along and offers a fair price, or the deal ends up back at market value anyway after weeks of haggling. Make your offer and negotiate the deal. To determine fair market value, do some research on recent sales of similar properties in the area. See what they sold for per acre, and apply that price per acre to the land you’re looking at. Remember to objectively take into account unique factors of each property that might affect the value. If the comparable property only has 50 feet of street frontage and the one you’re looking at has 300 feet, the market value of the one you’re looking at will be a little higher due to that feature. Maybe the property you’re interested in has a creek that runs year-round, or maybe the other property is adjacent to an oil well lease. All those things affect value, and I’ve seen people try to use the lowest price-per-acre comparable property to negotiate the sale when it’s clear that the property they’re trying to buy is the more desirable one, thus worth a little more. Just try to be fair. So how do you do the research on comparable properties? Typically one of two ways: ﬁnd a Realtor to help by pulling sale records from the Multiple Listing Service (MLS), or go to the county records to find land sale history in the area. There’s also a third option for finding the value—hire an appraiser. While it will cost money, it might be a worthwhile investment if the property you’ve found is the one. It might cost around $400, but that might not be a whole lot of money when you’re talking about the dream of building your forever home on your land. Once you’ve figured out market value, you have to compare it to your budget. Don’t forget to add the price of the land and the cost to get utilities and prep the site (see the “Evaluating Land” section above). After you add those items together, does it still ﬁt within your budget? Is there room between that amount and the top of your budget to negotiate? You’ll want to know how much room you have before you make your offer. To give yourself the best chance of getting your first offer accepted, make your offer on a written form, preferably the legal form approved by the state’s real estate commission. For Oklahoma, you can find the approved form on the Oklahoma Real Estate Commission website. Depending on your comfort level with negotiating a deal, you can present the offer to the owner yourself or you can engage a Realtor. Be aware that if the land is not listed on the MLS, the owner (seller) is not obligated to pay the real estate commission that the Realtor will earn for helping you with the transaction. If that’s the case, you will need to pay the commission yourself. Having the help of a professional real estate agent can be a huge advantage, so it’s worth the investment, in my humble opinion. I have engaged the services of a Realtor many times and happily paid the commission knowing I was getting more than that value in return. When negotiating the price, remember what I said above: don’t try to lowball just to get a good deal. I’ve seen that backﬁre so many times. Remember your budget—and the room you have to maneuver—and stay within it. If you use all your budget, that’s fine. It may be totally worth it if you get the land you are after. Closing date. Remember you’ll need to close on your loan (either land loan or construction loan) simultaneously, so make sure your lender is conﬁdent he or she can meet the deadline. You don’t want to lose your land at the last minute because the lender wasn’t ready to close. Concessions, such as including or excluding some item that exists on the property but isn’t really part of the real estate, such as equipment or supplies. That could mean a tractor or a small mobile home or a shed with a bunch of fence posts and wire. A pin survey, and whether you or the seller will pay for it. Property size. Think about what will happen in the event the property turns out to be bigger or smaller than originally thought. This may seem weird, but it happens, and the difference seems to always be that the property is a bit smaller. Once you’ve negotiated the contract, you can proceed with your survey and finalizing your loan, and then you’ll be ready to close. This step is pretty straightforward, but the time from contract to closing has some pitfalls you’ll want to avoid. Here are some things to keep in mind as you work through the process toward closing. After you’ve signed the contract with the seller of the land, you’ll send a copy of it to your lender. You’ll also send the legal description if you haven’t already done so. The lender will order the title work from the title company and hire an appraiser to determine the value, as described above in the “Financing” section. The appraisal is usually what takes the longest, and it determines the time it will take to close. Usually, the bank can close the loan within a week or less of receiving the appraisal. The appraisal can take anywhere from two to four weeks, sometimes longer if the land is farther away from the city where the appraisers live and work. Sometimes the title work is what takes the longest, which is what happens when there’s a problem. Every problem is different. Once we built a home for a woman who had inherited a piece of land that had been split from a larger piece her uncle owned. The uncle split the land and gave the pieces to his various family members. But another member of the family who owned the land prior to the uncle had not written the land deed properly, and there was a possibility that someone else could make a legal claim to at least part of the property our client wanted to build on. The process to clear up the problem took nine months because the title company had to hunt down about eight people to sign a document that said they released any claim they might have to the property in question. At the same time the appraisal and title work is going on, you or the seller will have a surveyor go out and do the pin survey mentioned above. This is when you’ll find out if what you think you’re buying is what you’re actually buying. It’s kind of an important step. Once the appraisal is done and the title is deemed clear by the title company, the lender has to prepare all their paperwork for closing. When they’re ready, the title company will set up a time for you, the lender, and the title company’s closer to meet and sign papers. After that, you’re a landowner! 6:How do I get the best house plan for my needs? Some people are able to look at home plans online and find one they think is a great fit for their family and take that plan to their selected builder. Others may find themselves frustrated by the process. Maybe the plans all seem the same, none of them fit your family’s unique needs, or you feel like you’re wasting time looking at endless pages of plans. If that sounds familiar, then a truly custom home plan might be right for you. You really can get the house of your dreams, provided you’re willing to put in the work up front and really think through your wants and needs. The key to the whole thing is following a process that will keep you focused on your family’s needs and wants and keep you from designing a house plan you can’t afford. But you also have to find the right person to work with you to build it. You need a builder who will truly listen to your needs and wants and create the house plan that reflects your dream. The process is simple and will help take the stress and anxiety out of the process. It will still take work, but it will be a labor of love rather than a labor of fear, anger, and frustration. 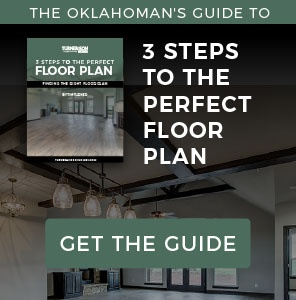 The next few sections provide an overview of this process, but you can get even more detail by downloading our free ebook, 3 Steps to the Perfect Floor Plan. Gather and save all your ideas in a way that works best for you, whether that’s on paper, electronically, or a combination of both. File folders, three-ring binders, Pinterest, Houzz, pictures, and ideas saved on a phone or computer—I’ve seen it all, and I’ve seen it all work well. It’s going to come down to focus and organization, but for now, just gather anything of interest. First, let’s separate what I call utility (how you’ll use, or live in, your house), from looks and finishes (how your new home looks and what kinds of finish materials you’ll use). For the first part of the “gathering” exercise, you’re going to focus on utility and worry about looks and finishes later. Think in terms of how you’re going to use, or live in, your new home. What bothers you about your current home? What floor plan problems are there? How would you solve them in a new house? Do I need more space? Where? Do I need a different arrangement of rooms? Better access to the back yard or garage? Am I tired of hearing the kids in the living room when I’m trying to sleep? Do I need more closets or an attic? Visualize yourself living in a new home. How does your day start? What happens when people leave the house or come home? Where do they drop their stuff? Do you work from home or homeschool? How do you spend your evenings and weekends? This visualization is critical because it’s what you’ll move toward as you shape your ideal house, and this vision will keep you from getting derailed when you start talking to house designers and/or builders. Next, write down the specifics of what you need. Note that it says need, not want. How many bedrooms, bathrooms, living areas, garage spaces, etc.? Think about the size you need each space to be, from bedrooms to kitchens to living areas. Don’t forget to think about how that might change five or ten years from now. Also think about the flow between rooms. Where should they be in relation to each other? Do you want the master bedroom on the same side of the house as all other rooms, or do you want it to be separated? Do you want your living room to look out on the front yard or the back yard? Do you need a guest bathroom near the back yard? Now that you have some idea of the number and size of rooms and the desired layout of the house, go tour some open houses that are in or below your budget. Take your notes and some extra paper for writing additional notes. It’s important to write stuff down—if you’ve ever shopped for houses, you know what I’m talking about. After a while, they all start to run together, and you won’t remember what you liked and didn’t. For each home you tour, ask the name of the company that designed the home. For newer homes, you may even be able to request a copy of the floor plan. Save that information for later. Visualize yourself living in each house as you tour—bringing in groceries, entertaining on the back patio, coming home from work, etc. Take a tape measure and use it to get an idea for how big the rooms really are. What do you like and dislike about the houses you tour? And how does that reflect on what you might like or dislike about your idea of a custom home? Before, during, or after touring all those homes, do your online or magazine research on house plans. Find ones that have elements you really like, save them, and mark them up to identify and help you remember why it is you liked certain designs. You aren’t likely to find that perfect plan (but it’s awesome if you do! ), so that’s not what you’re looking for. You’re looking for visual aids you can refer to later when painting your picture for the house designer, architect, or builder. It’s so much easier to work from pictures than from a blank sheet of paper. There are also specific things you’ll want to pay attention to, such as overall shape of the house, hallways and closets, wasted space inside the home, and so on. Every time the exterior of a house turns a corner, there’s some wasted material involved, which increases the total price. The same goes for corners and weird spaces on the inside of the house. Hallways and closets are important, of course, but you want them to be part of the house plan from the beginning, not an afterthought. Make note of all these things as you tour houses and look at plans. With your online and magazine research, you’re looking for elements that remind you of some of the homes you toured. It’s great to find design elements on a screen or paper, but being able to bring those elements to life in three dimensions helps you visualize the reality. For example, that enclosed 11-foot by 12-foot formal dining room looks great in the pretty magazine picture, but try putting a table in that room surrounded by chairs with family members sitting in them and you’ll see why it won’t work in real life. Thus far, we’ve talked about gathering thoughts related to the layout of house plans: square footage, number and types of rooms, and room arrangements. Now it’s time to apply the same techniques to the look and feel of houses (either in real life, online, or in magazines) to gather thoughts and ideas on the kinds of finishes and materials you’ll want for your new house. Think about how you want your new home to look and feel not just when it’s new, but also when you’ve lived in it for five years or so. How important to you is the look of your home? What kind of style do you want—traditional, contemporary, or transitional? Do you want the latest styles in granite, quartz, and floor tile, or is something more modest closer to your taste? How will these features hold up over time? By this time you have put a great deal of thought into your new home: the size, the number and types of rooms, the room arrangement, and how you want to live in your home. Now it’s time to organize those thoughts into lists to focus on designing the right home, with the right features, that fits realistically into your budget. As before, you’re going to separate the utility of the house (size, rooms, layout) from the looks and finishes. Why? One word: flexibility. Ultimately, you know you’re going to make compromises. I’ve said it before—everyone has a budget constraint, and everyone wants more than she or he can afford. That’s human nature. No house will be perfect, and if you don’t prioritize your needs and wants before the emotional letdown of budget reality sets in, you’ll get discouraged and quit because the dream will seem out of reach. Remind yourself why you’re embarking on this journey. Think about how it’s going to feel when your new home is complete, and you’re living the way you want, and deserve, to live. Don’t lose that. Make your list, get real about what you can and can’t live without, and you’ll get your dream. Take a minute to reflect on the real reasons you decided you wanted to build a new home. Write them down. Why? You’re about to put your lists of needs and wants in priority order. Staying focused on the real purpose will help keep you from getting distracted and missing the whole point. Focusing on your real reasons for building a custom home, start with the list you created during the utility part of the research you did above. What’s the number one, most important, can’t live without item on that list? Now, go through the rest of the lists you gathered and do the same thing for every other item you need and want (needs first, wants second). Once you’ve completed the utility section, move on to the looks and finishes section and do the same exercise. You now have two lists in priority order. Congratulations! Believe me, if you’ve come this far, you’ve done more than 99% of the people I work with, and you’ll be 99% less stressed out for the whole rest of the process. The next big task is to assign one of two categories to every item on those lists: must-have items or like-to-have items. It’s hard, I know! But this process helps you make rational decisions now to protect against emotional decisions later. Start at the bottom of the priority list, which is by definition the least important to you. When you’re finished with the exercise above, let your lists hang out for a few days. You’ll find yourself thinking about many of the items as you live your normal life in your current house. You’ll rethink some of them and realize some of your “must-haves” aren’t really. You might even scratch some stuff off the list entirely. When you’re done, you’ll have two lists in priority order and each item will be marked “must-have” or “like-to-have.” Wow. You have described, in words, your dream house. When you’re meeting with designers, architects, and/or builders, you can speak with confidence about the vision you have for your new home. That will make the process go so much smoother than it would have otherwise. Congratulations! Find and match: Who is going to craft this house plan, and how do we find the right match? You’ve come a long way in defining your vision. Now it’s time to find the home designer, architect, or builder who you trust to translate your vision (lists, photos, and descriptions) into a house plan a builder can build. This is obviously a critical step, and it presents a unique challenge in our world of high-technology and manufactured products: You don’t get to see the finished product before you buy. Think about that for a moment. You’re not going to buy a “house plan,” you’re going to buy into an individual. You can’t tell a prospective designer to draw the plans and then you’ll decide if you’re going to buy them—you have to trust that the relationship is going to work and that you’ll end up with the plans you envisioned. There’s a way to do this. A process. Commit to a process, just like before, when your rational brain is in charge and before the emotional decision-making time comes. How do you find house designers to interview? The best way to do this whole thing is to find a builder first, before you decide on your home design. A builder you trust will guide you through this whole difficult process, including finding land, designing a house, getting a construction loan, etc. Some builders even have in-house design teams or work with one designer exclusively, which makes the process even easier and more efficient. Builders know building costs, and the designer who works that closely with a builder will design with a knowledgeable eye toward efficiency in the building process. Still, you may want to interview more than one designer in the process, even if your home builder has an in-house designer. Go back to your list of home designers you gathered when touring newly built homes. Look at the designs and notes you made. If you didn’t like certain houses, scratch those designers off your list. If you felt like some homes weren’t built efficiently, scratch those designers off your list as well. You can call some local builders and ask who they recommend as a home designer. You can also use a Google Maps search in your area to search for home designer, house designer, or architect. A lot of the results will be for interior design companies, which you can ignore. You can also scratch any large architecture firms off the list, as they likely don’t build houses. Another worthy option is calling the local chapter of the National Association of Home Builders (NAHB). Home designers join local NAHB chapters to associate with their main clientele—home builders. Set up appointments to visit them face-to-face. Remember, we’re talking about building a relationship on trust, because you’re going to have to trust someone to design your house plans. This is worthy of a face-to-face, maybe more than one. While you want to know the answers to these question, you’re also trying to get an emotional feel for whether you want to work with this person or not. Interview several designers, as many as you feel you need to get the hang of the process, then go home and talk it over with your significant other. Talk about the answers to the questions, and talk about the feeling you get from those answers. Strike the ones that don’t give you a good feeling off the list, then continue to narrow the list until you feel you have the right one. If you can’t narrow it to one, go talk to the ones you like again. If you have it narrowed to two, ﬂip a coin, and the feeling you get right when you find out whether it’s heads or tails will tell you which one to choose. Congratulations! Time to start designing your dream home. For your first appointment, take your prioritized, categorized lists with you. The designer will love you for it. The most important advice for the design stage is to stay flexible. Do a preliminary design first with just a floor plan (drawn to scale) and a front elevation (view from the front). Take it home and live with it for a week. Don’t ask the designer to complete the working drawings just yet. Hopefully you’re working with a designer who is associated with the builder you’ve already chosen. The builder will help guide you through the rest of the design process so you end up with the right house plan for your needs and your budget. 7:How do I avoid the horror stories of building a custom home? If you’ve made it this far, you’ve already made serious progress toward making the home-building experience much less painful. The more you plan and think things through, the better the experience will be. I truly believe there are many builders out there who can, and will, deliver a truly high-quality custom home, but there are very few builders who can do it without making you crazy in the process or blowing your budget (or both). We’ve talked about planning, defining your budget, finding a builder, getting a loan, and designing the right house plan, so now what? Now it’s time to let your builder do his thing and follow his process. After all, he does this for a living. Since you’ve chosen a builder you can trust, it’s time to act on that trust. We live in an age of consumer products. They’re designed on computer systems, made in high-tech factories, and displayed in stores under tightly controlled conditions and wrapped in shiny, new, artistic packages. Your house is built outside in the rain, snow, wind, cold, and heat. It’s exposed for weeks or months. It’s built from natural materials, not manufactured ones. It is built by hand, not by computer-guided precision robotic machines. It is a prototype. It’s the only one being built. Do you think Boeing draws plans for a new passenger jet, builds a scale model, loads it full of paying passengers, and says, “Good luck, we’re pretty sure it will fly” to their customer? Of course not. Boeing builds prototype after prototype to solve all kinds of little issues they couldn’t predict in their cutting-edge computer-aided design software. If Boeing needs to build actual prototypes to solve little problems like where to run the wires that control the light in the airplane bathroom, do you think a builder will foresee every little detail in your one-of-a-kind custom home? If you can’t live with that idea and will be extremely upset by the first big mistake a subcontractor makes while building your new home, then don’t build a new home. Go buy an existing one and save your sanity. If you understand and have made peace with the fact that the world is a wildly imperfect place and you trust your builder to correct inevitable mistakes, read on. Key concept: you’re not just buying a house, you’re buying into your builder’s building process. The only way you’ll get the finished product your builder promised is to let him do what he does. Again, if you don’t want to let the builder do it the way he’s done it hundreds of times, and rely on the wisdom of the lessons he has learned, then don’t expect the process to go well. Asking, or expecting, the builder to go outside the process he has built over years of building and correcting mistakes, is just like putting those paying passengers on the prototype Boeing jet and just wishing for the best. You’ll crash and burn. I’ve seen it happen more times than I’d like to admit. You’ve followed the process. You’ve hired the builder you trust. Now trust him or her. You’ve found your builder, bought the land, have a house plan you’re in love with, you’re comfortable with the price, and you just closed on your construction loan. Your builder is sending out the dozer tomorrow to begin work. Oh, the joy of beginning work on the dream you’ve had is real! It’s really happening! You’re at the top of the hill. The emotional roller coaster ride has begun. The house starts to take shape, you invite your friends over to see the progress, and you’re riding that emotional high. The framer misinterprets a detail on the plans and frames a door the wrong width, or leaves out a window, and your emotional high turns into borderline depression. Yep, that’s really what it’s like. Just because you’ve bought in to the builder’s process, and you’re committed to moving forward, doesn’t mean there aren’t stressful times ahead. You are emotionally tied to the outcome. This is your family’s dream, their financial future, and your future lifestyle, and those things are critically important. That means every mistake, every warped board, every dirty handprint on a newly-painted wall is going to get under your skin. Just know that going in. Also know that every beautiful new home you’ve ever toured while dreaming about having one just like it for your own went through this exact same process. The difference is that you didn’t have the emotional attachment to those houses. If the builder of that beautiful model home told you all the things that went wrong during construction, you’d look around, seeing that everything got fixed, and your rational mind would make sense of it. Somehow, though, when it’s YOUR home that gets a broken window or a muddy footprint on the carpet, your emotions kick in and you simply can’t BELIEVE that a contractor could do anything that stupid. So, just relax, breathe deeply, and be really, really glad your builder has your back and is going to do what he does, and the end result will be what you expected. The process is ugly. That’s a fact, plain and simple. Once it’s over, though, and you’re living the dream of that new home, it will all have been worth it. To wrap all this up, here’s the basic physical process of building the house once you’ve bought the land and closed on the construction loan. The builder will schedule the job using some kind of tool, whether it’s a simple calendar or a complex project management software program. The unpredictability of weather, human error, equipment breakdowns, and subcontractor planning, means that the job schedule is only accurate for about a week in advance. It’s just like the weather forecast in Oklahoma: the 7-day forecast is maybe 70% accurate, but the 12-hour forecast is pretty much right on the money. Take any schedule with a grain of salt. The builder definitely does. There will always be delays. If the builder has promised you a move-in date, and the builder is experienced, competent, and honest, then the move-in date has delays built in. That means the rain that cost a week fits into the schedule. The builder knows that it is going to rain during construction, and he factored it in. Don’t stress out about it. All builders must follow the building code prescribed by the state, city, or county where your home will be located. Even if there are no inspections, as in many rural areas of Oklahoma, the builder is obligated to build according to the current adopted International Residential Code. Many people like to say that the code is just a bare minimum standard, but that is wildly inaccurate. There is a large margin of safety built in to accommodate the vagaries of building by hand with natural materials. Over-building relative to the building code is a waste of money. Think about it: how many houses have you seen or heard about that simply fell down? Right. You haven’t. Having said that, every city or county that has a building department has a different way of enforcing the code. There’s a city near Oklahoma City that requires 5 different drainage inspections. Yep, they want to look at the exact same thing 5 times. I suspect that somewhere in the past the city lost a lawsuit that had something to do with drainage, so that’s their way of making sure that never happens again. The reason for bringing this up is to point out the fact that the building inspectors are like little mobile fiefdoms that can enforce the rules any way they see fit, and as a result, your house will get “red tagged” for myriad “defects” that are simply an individual inspector’s personal preference. It’s OK – your builder knows it, is prepared for it, will correct the “problem”, get a green tag, and proceed as normal. That “red tag” is a surprise and disaster from your perspective, but all in a day’s work for your builder. As your home is being built, lots of things will get broken, damaged, dirty, or will simply get done wrong. Some of those things will get fixed as the building progresses, some won’t get fixed until the end. The timing will depend on what the item is and whether it is logistically more feasible for the builder to fix them during construction or wait until the end. Regardless, they’ll all be fixed before the builder calls the house finished. One the builder says he’s finished, he or she will invite you to walk the house and inspect it for yourself. During that walk-through, you’ll create a list of things you’d like touched-up, a list we call the “punch list”. During that process, you’ll find things that don’t meet your approval even though they might have met the builder’s. That’s OK. There are things that are totally acceptable from a craftsmanship standpoint that simply bother you personally. We have a saying: If you want 10 different punch lists, have 10 different people do a walk through. Except for items that have a long lead time, such as a crack in a window that nobody saw until the walk through, the builder should be able to complete everything on the list within a week. If the list is simply too long to finish in a week’s time, then the builder wasn’t really finished. A NOTE ON FINISHING A HOUSE: You have to let the builder finish. Don’t ask to move some stuff in early. Don’t press to move in while he or she is still working. It will NOT end well. I promise. ANOTHER NOTE ON FINISHING A HOUSE: Assuming you didn’t get in the way, don’t let the builder pressure you into moving in and paying the last bit of money until the punch list is reasonably complete. By reasonably I mean that all the touch-up is done, and anything outstanding is something that came up at the end and the builder is waiting on something to be delivered or manufactured (like the cracked window pane). If he simply didn’t get the painter in to touch up those spots in the bedroom, then you should insist that the painter finishes before you move in. Once the punch list is complete, and the house is clean, it’s time for you to move in and begin enjoying your new home. Remember that your home is like your spouse: it isn’t perfect, but you love it anyway. You’re going to move in and wish you’d put the kitchen light switch on the other wall, or that you’d moved the door in your son’s bedroom 6 inches to the left. I’ve built 2 homes for my family, and both times there were several things I wished I had done differently, and I’m supposed to know better. You just can’t envision everything. Shake hands with it and don’t let those little things rob you of the joy of living in the new home you’ve dreamed about. Building a custom home is a long and sometimes stressful process. But if you start out with a trusted builder to guide you through a structured process, it’s a lot less stressful. Think of the relationship with your builder as a partnership and not simply a transaction, and be sure to invest the necessary time up front to decide if it’s the right partnership for you. Do your homework at each step of the process to educate yourself, because realistic expectations are important. Expect some delays and mistakes along the way, because it’s going to happen with any one-of-a-kind home. In the end, when you’re living in the home of your dreams, it will all be worth it. We promise. I had almost decided to forego the dream of building a home by my parents. Then I made a phone call. Athena answered the call she listened to what I wanted to do and she assured me there was a way.. it would and could be done and within my budget. The day we met she talked of a woman she read about who daily had to endure adversity just surviving. I felt a connection with her and knew she realized that a home is so much more than just a home and I wanted to live everyday near my parents and was not going to let that dream go. We began the process in 2014 and now March of 2016 the dream is a reality. I have been totally pleased with the entire process and all the people involved that supported me and the dream all within my budget. I love my house it is the perfect size and has the granite and the marble and everything else that I wanted. It is a custom build down to the shower seat measured just to my specifications. Thank you Athena and everyone else involved in my Dream Home!